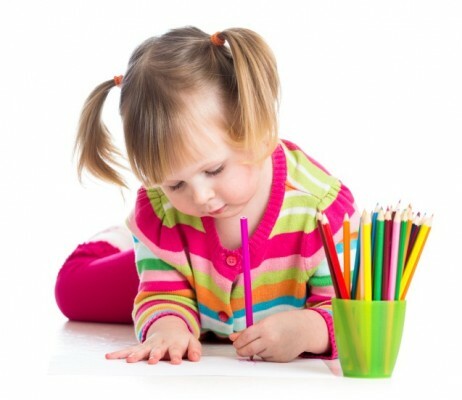 Is it right for my child to be left-handed? Kim Greenberg, M.O.T., O.T.R., an occupational therapist for Cook Children’s and works in the specialty clinics in Arlington and Mansfield, gave us some insight into dysgraphia. The growing curiosity of toddlers’ hands happens before we know it. They begin by watching their hands open and close, then playing with their hands in front of their eyes, eventually reaching for different rattles and toys, and soon pulling on mommy’s hair. Crawling is also an essential developmental skill that builds upper body strength; especially building the hand muscles of the thumb, pointer, and middle fingers, as these are the fingers that will ultimately hold writing tool. As children’s eye-hand coordination continue to progress, they will become increasingly curious and independent with holding their own bottle, cup, spoon and fork. Eventually, children will show interest in holding crayons and scribbling on paper. At first, a child may show a full fisted grasp pattern, and not show a preference to use either hand. I often recommend that parents do not force hand dominance. Therapists often recommend that a utensil or writing tool be placed in a neutral midline position in front of their child. Whichever hand children initiate using will typically become their dominant hand. Once children show their hand preference, parents may encourage their child to then develop their feeding and pre-writing skills. When children turn 6 years of age or begin kindergarten, they will have established their hand dominance of being either right-handed or left-handed. Then there is the subject of dysgraphia, or “difficulty with handwriting.” Handwriting is a complex process. It involves a combination of many systems to include visual-motor, eye-hand coordination, motor planning, learning and memorizing the shapes and forms of letters and numbers. To complicate matters, there are also many types of handwriting curriculums. When a child has a diagnosis of dysgraphia, I often ask their parents to attempt to write using their non-dominant hand, as this is how it feels to our children as they begin to write. Now more then ever, there are more pressures on our children to be enrolled in pre-school and pre-kindergarten programs that force them to write when they’re simply not developmentally ready. I have also worked with children who demonstrate a hand dominance for feeding and writing, and a different hand dominance for playing sports or a musical instrument. The fact remains that we live in a right-sided dominant world. I often educate my parents to support their child no matter what their natural hand dominance. As a child begins playing sports or a musical instrument, a qualified coach or teacher will understand how hand and foot dominance affect the skills of the child. A “switch hitter” is often the most valuable position in baseball. A parent should feel empowered to tell their child’s coach and teachers of their child’s natural dominance, and that a child should be taught in a positive manner that develops his skill and confidence. Most importantly, I would like to stress that even with the most proficient grasp pattern, a child may still demonstrate dysgraphia, or poor handwriting legibility. In this instance, a child should be evaluated by an occupational therapist, either from a reputable outpatient clinic, such as the Rehab facilities at Cook Children’s or from an occupational therapist through his or her school district. Kim Greenberg, M.O.T., O.T.R., an occupational therapist for Cook Children’s and works in the specialty clinics in Arlington and Mansfield. Cook Children's Healthcare System provides a full spectrum of occupational therapy including inpatient,outpatient, and home health.